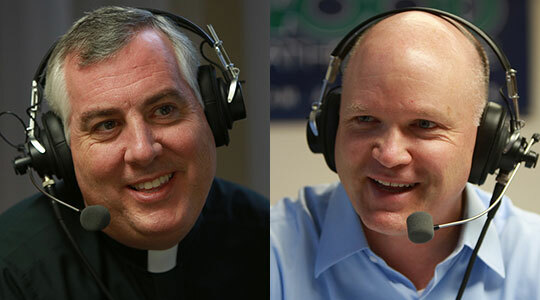 Summary of today’s show: On the last day of the WQOM Fall fund drive, Scot Landry and Fr. Mark O’Connell discussed the Al Smith Foundation dinner in New York last night and Cardinal Timothy Dolan’s funny and pointed remarks before the Democrat and Republican candidates for President; the witness by TV and movie actor Kevin James to his Catholic faith; and this Sunday’s Gospel readings. 1st segment: Scot Landry welcomed Fr. Mark O’Connell to the show. Fr. Mark said congratulations to Scot for 399 shows. Scot said it’s a milestone, but it doesn’t have the cachet of 100 or 500. Scot said one of the bigger Catholic events this week was the Al Smith Dinner in New York to support Catholic charitable work in New York. President Obama and Mitt Romney were both present and it’s one of those events where the speakers roast everyone. Cardinal Dolan gave his remarks. Thank you, everybody, for your gracious company this evening. What a unique honor and joy to welcome and thank our two candidates, and Mrs. Romney. Our two candidates claim that both your parties, the Republicans and the Democrats, are “big tents,” containing extraordinarily diverse, even contrary, opposite people and groups. Well, you don’t have a thing over the Catholic Church. We got both Biden and Ryan! Governor Romney, thank you for being up here sitting next to me; although I must confess I was secretly hoping the Republican candidate would be Governor Christie, because I sure would have looked good sitting next to him! Mr. President I trust you’ll be able to report to Mrs. Obama that I ate my vegetables and salad. If she had been “first lady” instead of Mamie Eisenhower when I was growing up in the 50’s, I wouldn’t be in this shape! As you may know, I just returned from Rome a couple of hours ago, where I’m participating in the Synod of Bishops. Thanks to Mr. Mort Zuckerman’s jet, I will be able to return to Rome right after the dinner. By the way, just before I left this morning, Pope Benedict XVI asked me to deliver a special personal message to both candidates. Mr. President, Governor Romney, do you know what the Holy Father asked me to tell you? … neither do I, because he said it in Latin. Both candidates expressed shock that Mayor Bloomberg had a 16 ounce cup in front of him. Not to worry, Your Honor — I explained to them that it was not a sugar-laden soft drink, but a martini. The mayor might want to challenge that remark, but, I’m sorry Mr. Mayor, Candy Crowley has already said she agrees with me. Only the Al Smith dinner could bring together two men, of the same calling, who disagree on almost everything, both of whom think they are the world’s experts on everything, who don’t like even being in the same room together: Roger Ailes and Chris Matthews. The Al Smith Dinner … in thanking all of you for your presence and support, might I suggest that this annual dinner actually shows America and the Church at their best? privileged to be in the company of two honorable men, both called to the noble vocation of public service, whose love for God and country is surpassed only by their love for their own wives and children, and who, as happy as I hope they are to be here with us tonight, would rather be home with Michelle, Ann, and their families. Government, Al Smith believed, should be on the side of these “uns,” but a government partnering with family, Church, parish, neighborhood, organizations and community, never intruding or opposing, since, when all is said and done, it’s in God we trust, not, ultimately, in government or politics. God bless the memory of Al Smith! God bless all of you for helping them this evening! God bless our two candidates! Thank God for this grand evening! Scot said Dolan went from engaging people in laughter and joy and then made the Church’s pitch for religious freedom and for those who need help in society and how the Church serves them. Fr. Mark said both he and Scot experienced then-Msgr. Dolan when they were all in Rome and how he could come into a room and engage everyone. Scot said Cardinal Dolan took heatfor inviting Obama to the dinner for the administration’s lack of respect for life and for religious liberty. Dolan took on the religious liberty issue head-on in a civil but blunt way. Scot said Cardinal Dolan loves the apostolate of Catholic radio, with his own radio program in New York. 2nd segment: Scot said he was surprised by a story in the Pilot this week about actor Kevin James, TV and movie star. It turns out he takes his Catholic faith seriously. He wants to glorify God in every way. He wants to have a positive message and be able to sit and watch movies with his children. Fr. Mark said James has always been relatable, but to find out he’s a cradle Catholic who takes his faith seriously is even more inspiring. Scot and Fr. Mark discussed what James said about struggling at times to live his faith and to pass it on to his children. Scot said to integrate your Catholic faith into your kids helps you live your values more. Fr. Mark said there’s a lot of people who walk down the aisle at confirmation as if it’s a graduation and come back later, regretful they wasted all those years and realize now that their faith is fulfilling. Part of growing in faith is realizing that all our blessings come from God. Kevin James got where he is on talent, but also as a blessing from God. Fr. Mark talked about the similarity between Kevin James and Cardinal Dolan in that they are filled with joy. Fr. Mark and Scot discussed the Catholic understanding of joy as being fulfilled in what you’re doing as what God wants us to be and do. While we’re not always happy in every moment, we are joyful. Scot said there is a connection between joy and holiness, especially with examples from Mother Teresa and Pope John Paul II. One of the foundations of joy for Scot is that gratitude helps leads to joy. When you add up all the things with which God has blessed us, that’s when the sense of joy resonates. Fr. Mark tells a story about how joy brought conversion to a profoundly unhappy man being served by Mother Teresa’s sisters. Scot said there are three parts to this Gospel. The first is a natural request to be close to JEsus. Jesus responds he can’t guarantee that. They don’t realize that to be closest to him, they will have to imitate him in his Passion. The second part is the others being indignant as the presumption of James and John. Jesus responds the model for the Church will be servant leadership, giving full attention to the least of our brothers and sisters. Scot recalled a story where he met Pope John Paul II and how focused he was in that moment on Scot who was before him. Fr. Mark said the apostles start with a very real request to do what they ask. They think Jesus is going to be heading into battle so they had their plan all ready. We can do that with God, presuming his plans for us. But God has other plans and they’re always so much better than ours. His plan was suffering for all in his love and humanity. Scot said we’ve all been in the different roles shown here, including leading in the right according to our faith or not leading in the right way. When we stumble and it’s too much about us, we have the Sacrament of Reconciliation. Fr. Mark said just wait for God’s plan for you.